How People Manipulate AdSense Earnings Screenshots Easily? Before I acquaint you with the surprising yet disappointing fact about how comprehensively people fool around on the internet by posting fake screenshots of the Google AdSense earnings, the purpose of this post is to make you aware of this fact so you do not fall in the trap of false claims and impractical earnings screenshots posted by bloggers on their forums. 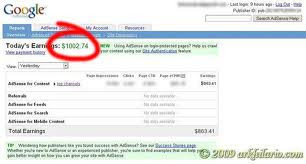 As photo morphing and the use of photo-shop is widely spread over the internet, some of the bloggers have made their ways by posting unbelievable fake Google AdSense earnings screenshots on their blog pages. Infact you might be scandalized to know how easy it is to create such fake AdSense income screenshots, with no support of photoshop at all. There are many bloggers using this technique, getting screenshots from their AdSense account and editing the amount to a fairly believable, but high figure to mislead the innocent audience. Perhaps the easiest way to edit a web page browser and then capture the screenshot using the Print Screen key, or by using any other screen capturing software is shown above. How To Receive AdSense Payments? 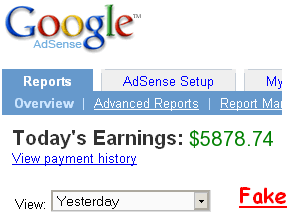 Google AdSense Generator is another tool that can produce a real looking screenshot of your Google AdSense earnings. It focuses on the edited income that you explicitly want to specify and black out the rest of the details. It is basically another sign generator, which asks for today’s and yesterday’s income and fills in the same image with the variables you specify. This tool has made the job of showing a believable yet fake Google AdSense earnings screenshots a lot easier and comprehensive. A further use of professional photoshop tools enhances the fake image even better. BloggingeHow | Making Blogging Simpler: How People Manipulate AdSense Earnings Screenshots Easily?